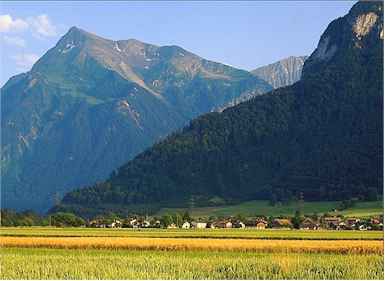 ABOVE: The Niesen is a massive pyramid that rises above Lake Thun and nearby grain fields. The Bernese Alps are dotted with mountain railways, cable cars, and funiculars. Some, like the Jungfraujoch Railway and the Schilthorn cable car, are mentioned in every guidebook; others, like the Stockhornbahn, are unknown to most English-speaking tourists. The Niesenbahn, a funicular on a 2,262m (7,749-ft) mountain overlooking Lake Thun, falls into the latter category even though it's been in operation since 1910. But make no mistake: the mountain offers spectacular views in all directions. Best of all, tickets are at least 50% cheaper than more famous excursions. The funicular is called the Niesenbahn, and it's open from mid-April through mid-November. Funiculars depart at regular intervals from the valley station between 8:00 a.m. until 5:30 p.m, with additional evening departures on Wednesdays and Saturdays at certain times of the year. The funicular takes 28 minutes to reach the summit. Options include fares to either of the two intermediate stations and a Wanderbillet or Hiking Ticket that lets you hike between any two stations on the way up or down. If you're ambitious, you can walk downhill from the summit to Frutigen (a popular resort in the L�tschberg region) in about four hours. A mountain lodge built in 1856, the Berghaus Niesen Kulm, offers snacks, meals, and and eight hotel rooms with shared toilet facilities. For information on accommodations and meals, see the Niesenbahn's Web site (link below). To order funicular tickets, book an evening trip or "fullmoon dinner," or reserve an overnight hotel package, use the Niesenbahn's online booking form. The Niesenbahn's lower station is in M�lenen, on the railway line that connects Thun, Spiez, Frutigen, and Kandersteg (schedule 301 in the Swiss Official Timetable). Local trains stop in M�lenen; the trip takes about 23 minutes from Thun and 7 minutes from Spiez. For more advice on reaching the Niesen by train, car, bus, or on foot, see the Niesenbahn's travel information page. From Interlaken to Spiez, the steamer takes about an hour; Thun to Spiez is just over 45 minutes. The company's official Web site has timetables, fares, a reservations form, and other resources for visitors. Ride a cable car, hike a nature path, or try a 100m bungee jump on this other mountain near Lake Thun. This medieval city isn't just a gateway to the Bernese Oberland. It's also worth visiting for its castle and other attractions.